Outhouse bathroom decor is a fun and nostalgic decorating theme for those who love everything rustic or old-fashioned. For any young whippersnapper who might not know what an outhouse is, there was actually a time in our not-so-long-ago-history when homes did not have indoor plumbing. The outhouse was a small building just outside the home, where family members had to go to relieve themselves. The iconic picture of an outhouse is a small wooden shack with a triangular shaped roof. There is usually a moon shaped cutout in the door. If you've ever wondered why there was a moon shaped cutout in the door of most outhouses, there are few credible sounding explanations for this. Go ahead and pick the one that sounds best to you. Along with no indoor plumbing during the time of outhouses, there was also no electricity. The small moon shaped cut out, located high on the outhouse door, was put there so that just enough light could shine in to see what you're doing. Whether it was sunlight or moonlight, one needed privacy without being in total darkness. With this theory, the crescent moon cutout was not needed for light because most outhouses had a vent high on the back wall that let in light and fresh air. Instead, the crescent moon cutout was a handy shape to stick your hand through to open the door from the outside or hold it closed from the inside. There was no latch or handle on the door because extra hardware such as this was hard to come by and the crescent cutout was just easier and cheaper. Many people were illiterate when outhouses were in use. The symbol of the moon is another sign for womanhood. Outhouses with the crescent moon were originally intended for women. Men's outhouses had a starburst or sun symbol carved in the door for Sol, the masculine counterpart to the moon symbol. It is believed that most men's outhouses fell into disrepair while the women's were better kept. Therefore, eventually everyone started using outhouses with the moon symbol on them. No matter which theory is actually the truth, one thing is for certain. The crescent moon on the door of an outhouse has become a symbol of nostalgic Americana decor. 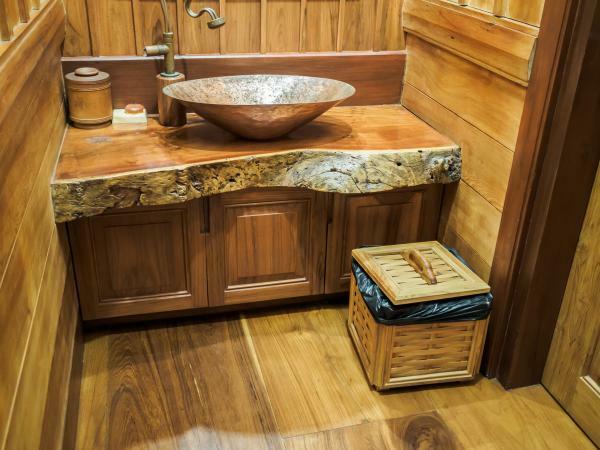 You can give your bathroom a very rustic or country primitive style using outhouse bathroom accessories. This style of decor would also work well with shabby chic or cottage style homes. To take the look even further, you can add a pedestal sink and an old-fashioned, claw foot bathtub with a round or curved shower curtain rod around it. Be sure to include the outhouse shower curtain. You can also look for old-fashioned light fixtures for your bathroom light. Finally, you can even go one step further by visiting a few thrift shops or antique stores. Look for authentic antiques you could place around the bathroom, like an old-fashioned steel milk jug, turn-of-the-century newspapers or magazines and maybe some antique medicine bottles you could place on a bathroom shelf. A vintage vanity tray with antique perfume bottles and a vintage hand mirror would add to the nostalgia as long as you have adequate bathroom shelving to display these items. Have fun with outhouse bathroom accessories, they'll help you appreciate modern indoor plumbing!